Bazooki-pocalypse from Flash Chaz, Marsh Games, and Shock-Dingo is a clear-cut retelling of the classic tale of Sleeping Beauty, except here the part of Beauty is played by a grizzled dude, and the cursed spinning wheel by some toxic bazooka juice(?!) fumes. When he awakens from his enchanted slumber, he discovers the zombie apocalypse happened while he was out, but luckily for us video games have prepared him for exactly what to do, in much the same way Grand Theft Auto can prepare you for a driving exam, and Fallout 3 will train you to work retail. In each level of this projectile-based physics puzzle game, you have a limited supply of ammunition to take out the zombies lingering around motionless. Click and hold to aim, and release to shoot! 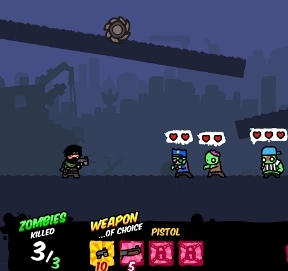 Each zombie has hearts above their head representing their health, and while in most cases they all require multiple shots, sometimes you'll need more than simple firepower to take them out. Precariously balanced saw blades, explosive barrels and more will do the work for you if you can figure out the proper order in which to blast things. Bazooki-pocalypse's strongest suit is definitely its humour and ghoulish charm, with the great sketchy artwork, voice acting, and totally legit factoids that appear between each level making the game feel like a fun, light-hearted experience, more grin-worthy than grotesque. Though it starts out slowly and easily, things get more difficult when you have to work with something that makes aiming more difficult, or around things that could kill Hans, our hero, if you hit them by mistake. Beating levels is often easy, but beating them while meeting the conditions for the A+ ranking (only revealed after you complete a level) is often harder. The downside is, well, that it starts out too slowly and is often too easy throughout, with most levels being straight-forward, oddly scant in design, and light on puzzling. The game would have been half as long and stronger for it by beefing up the challenge and complexity of the levels throughout. The game is so gleefully silly in its wonderful presentation that you sort of want the gameplay to revel in that sense of humour and limb-tossed whimsy too. Bazooki-pocalypse isn't quite as chaotic and clever as it could be given its premise and style, but it's still a fun and beautifully presented little game that makes the brain-eating, pus-dripping end of the world look almost cuddly. standard physics game. fun and distracting. Only problem I had was that you find out the level 'objectives' AFTER you complete the level... so you gotta beat some levels twice.